South Korean guitar behemoth Cort has announced the latest addition to its acoustic bass roster, the AB850F. 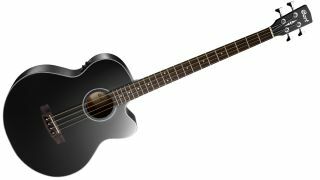 The bass's full-sized jumbo body offers a spruce top and mahogany back and sides, and comes in natural or black finishes. Attention to detail comes courtesy of a dovetail neck joint and Venetian cutaway for upper-fret access, while a 22-fret rosewood fingerboard on 34" scale length neck is complemented by a rosewood bridge. This electro-acoustic also includes Fishman's Isys + EQ preamp, which features a two-band EQ, LED tuner and phase control, as well as a Fishman Sonicore pickup. The AB850F is available now for $449, including gigbag.